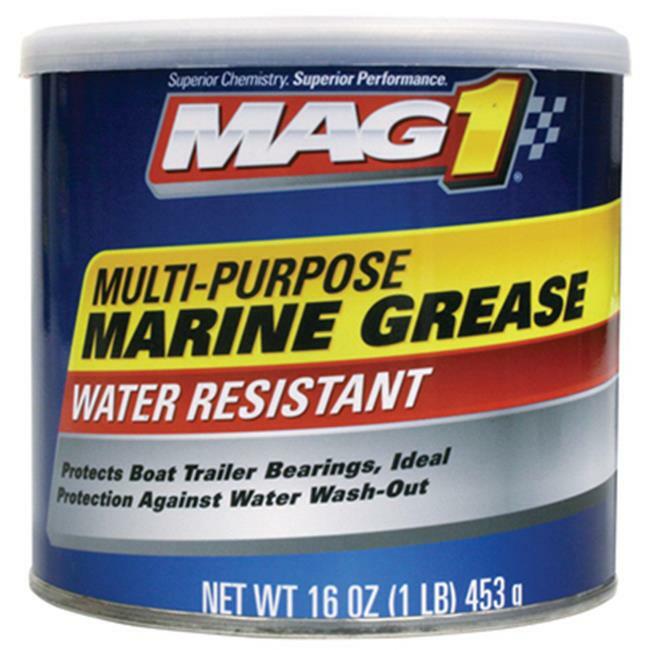 Mag 1 MG640016 Marine Grease 1 Lbs. Tacky Grease Which Resists Water Washout Even Under The Most Severe Conditions Including Saltwater. Formulated With High Quality Base Oils & Additive Systems. Provides Superior Rust & Corrosion Protection Plus A High Melting Point NlGI Grade 2 Exceptionally Versatile. Resistant To Water Washout Even Salt Water Superior Protection Against Rust Corrosion & Oxidation Functions Well Under Severe Conditions. High Melting Point (500°F) (260°C). Smooth Texture Highly Tacky NlGI Service Classification lbs. Dimension - 4 x 4 x 0.75 in. Item Weight - 1.1 lbs. <b>Features</b><ul><li>Marine Grease.</li><li>Specially Formulated With Premium.</li><li>State-Of-The-Art Lithium Complex Grease.</li><li>Tacky Grease Which Resists Water Washout Even Under The Most Severe Conditions Including Saltwater.</li><li>Formulated With High Quality Base Oils & Additive Systems.</li><li>Provides Superior Rust & Corrosion Protection Plus A High Melting Point NlGI Grade 2 Exceptionally Versatile.</li><li>Resistant To Water Washout Even Salt Water Superior Protection Against Rust Corrosion & Oxidation Functions Well Under Severe Conditions.</li><li>High Melting Point (500&degF) (260&degC).</li><li>Amber Color.</li><li>Smooth Texture Highly Tacky NlGI Service Classification lbs.</li><li>Dimension - 4 x 4 x 0.75 in.</li><li>Item Weight - 1.1 lbs.</li></ul>. Enter the details of an online store that carries UPC 071621601327 below. The store's URL must go to a valid product page that has the product displayed with pricing information.